The House will vote tomorrow to elect a Speaker of the House. While it is likely that Rep. John Boehner (R-OH) will be reelected, if 17 conservatives decide to vote against Boehner, it could lead to the first second ballot for speaker since 1923. There are no indications Boehner will not be re-elected Speaker. While there will likely be members who vote against him, there is no real candidate that could garner enough votes to take Boehner down. 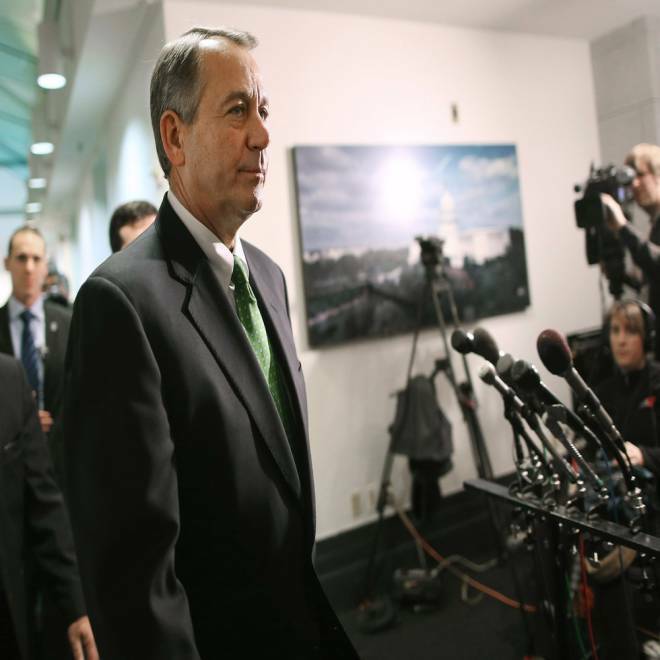 House Speaker John Boehner (R-OH) leaves a House Republican Caucus meeting. The 113th Congress will convene for the first time at noon Thursday, after which the House will vote to elect a speaker. Members will be called by name alphabetically and asked for their vote. This vote is different than typical votes, which are done electronically during a set period of time. The next speaker needs a majority of all votes cast to be elected. They do not need a majority of the full membership of the House. The 113th has 434 members because Rep. Jesse Jackson Jr.'s seat will be vacant. If all members were to vote, Boehner would need 218 votes, unless there are members who are absent for the vote or members who vote "present" (for no one). Since 1913, the year the House reached the size of 435 members, there has only been one time that no candidate received the majority of the votes cast for speaker. That was in 1923, when nine ballots over three days were needed before Rep. Frederick Gillett (R-MA) was reelected to the position for a third term. The speaker does not have to be a member of Congress, but in the history of the House of Representatives there has never been a speaker who was not a member. Rep. Louie Gohmert (R-TX) nominated Newt Gingrich this year during the Republican Conference meeting, but that nomination was not seconded, and Speaker Boehner was nominated by a voice vote (no objectors) to be the Republicans' nominee yet again. Democrats chose to have Nancy Pelosi as their nominee for Speaker of the House. Between 1943 and 1995, only the nominated Republican and Democrat received votes, but before that, it was customary for members of other groups within parties would garner votes as well.